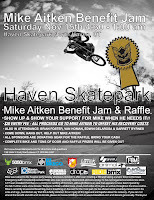 There's a Jam for Mikey Aitken at the New Haven Park this Saturday being put on by Jeff Allen. Be there and raise some money for Mikey. More info on the Flyer. This past Friday we had a Birthday party for Moshi Moshi at my shop, we put out a jar for Mikey and raised $403 bucks. Thanks for everyone who came and donated...pics of the party will be up soon.